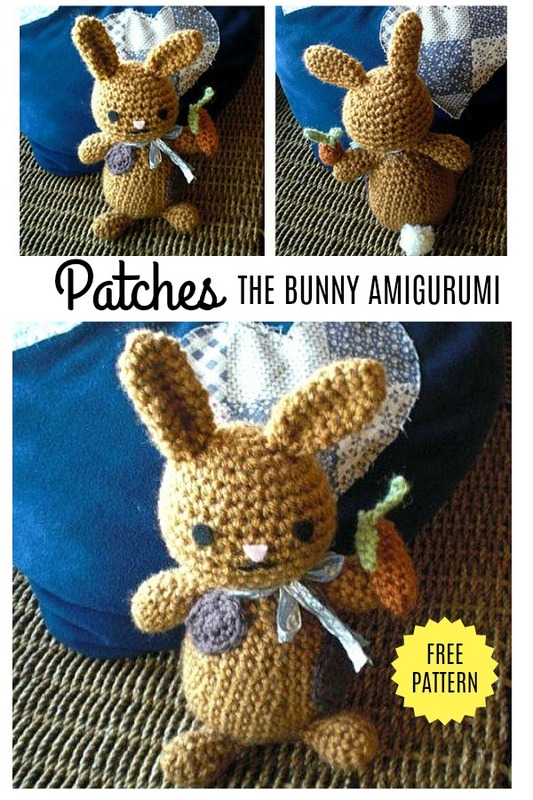 I created this Bunny amigurumi pattern for a teacher friend of mine who had a brown bunny rabbit named Patches. Patches enjoys hopping around the fields and eating carrots all day long. What a life! 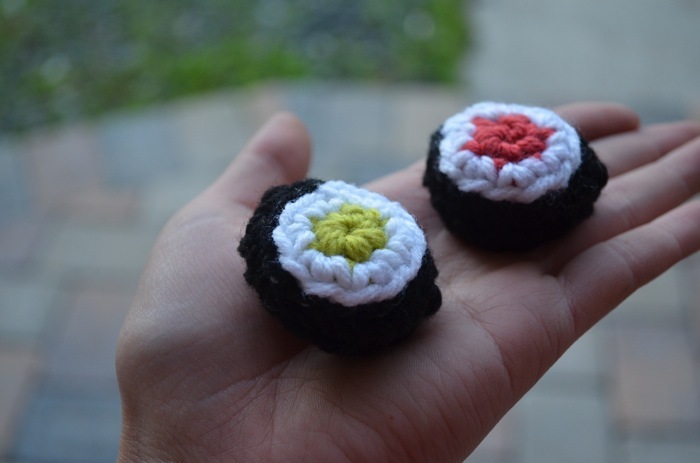 So I’ve also included his favorite snack in this free crochet pattern as well. 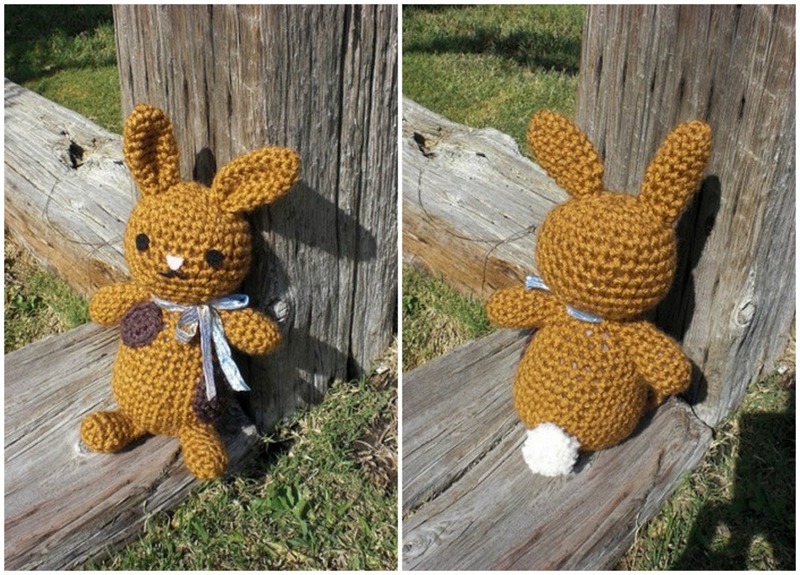 Hoppy Crocheting! *Disclosure: This post contains affiliate links. This means I may receive a small commission if you decide to purchase anything by clicking on one of these links. 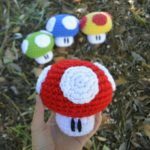 There is no extra cost to you and it helps me to keep creating free content and patterns for you guys on this blog. Thank you for your support! Do not join rounds. This pattern is worked in continuous rounds. TIPS: Use a bobby pin as a stitch marker! Round 4: [2 sc in next st, sc in next 2 st] around – 24 sc. Round 5: [2 sc in next st, sc in next 3 st] around – 30 sc. Round 6-11: Sc in each st around. Round 12: [Sc2tog, sc in next 3 st] round – 24 sc. Round 13: [Sc2tog, sc in next 2 st] around – 18 sc. Round 14: Sc in each st around. Round 6: [2 sc in next st, sc in next 4 st] around – 36 sc. Round 7-9: Sc in each st around. Round 10: [Sc2tog, sc in next 4 st] around – 30 sc. Round 11-12: Sc in each st around. Round 13: [Sc2tog, sc in next 3 st] around- 24 sc. Round 14-15: Sc in each st around. Round 16: [Sc2tog, sc in next 2 st] around – 18 sc. Round 17-18: Sc in each st around. Round 1: 4 sc in adjustable ring. Round 2: 2 sc in each st around – 8 sc. Round 3: [2 sc in next st, sc in next 3 st] around – 10 sc. Round 4-9: Sc in each st around. Pinch ends together and sew closed. Round 1: 4 sc into adjustable ring. Round 4-6: Sc in each st around. Round 7: Sc2tog all around – 5 sc. Round 8-9: Sc in each st around. Round 2: 2 sc each st around – 12 sc. Round 3: Sc in each st around. Round 4: [Sc2tog, sc in next 4 st] around – 10 sc. Round 5: [Sc2tog, sc in next 3 st] around – 8 sc. Round 6-7: Sc in each st around. Round 3: 2 hdc in next 2 st, sc in next st, sl st in next st. Round 2: Sc in each st around – 12 sc. Round 4: 2 hdc in next 2 st, sc in next st, sl st in next st. 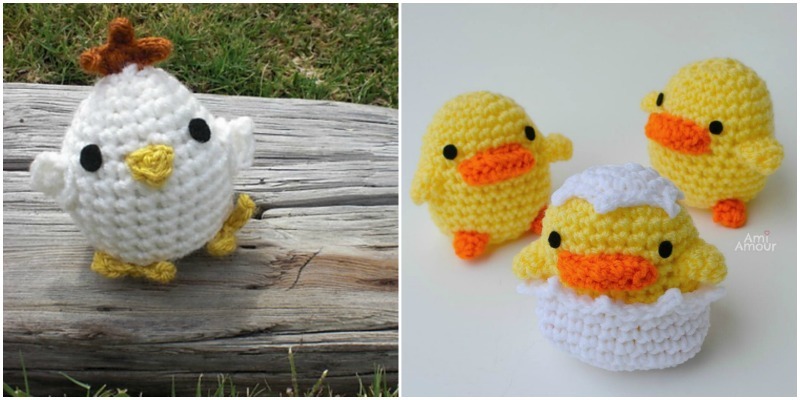 Stick two of your fingers out and wrap the yarn around them 25 times (1). Cut the yarn. Use the same yarn to wrap around the center of the bundle and tie a knot (2). Wrap around the center again and tie a knot once more. Cut the yarn long enough to sew Pom Pom Tail onto body of bunny. 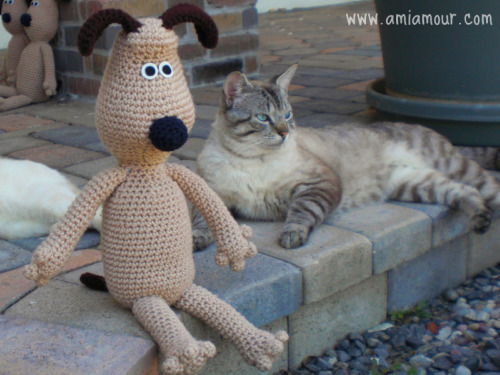 Cut the loops on both ends on the bundle of yarn (3a, 3b). 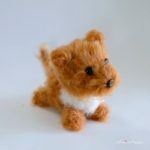 Trim the edges with your scissor to make a fluffy pom pom for the tail (4). 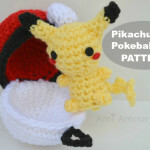 You can also watch this Pom Pom video tutorial. Round 2-6: Sc in each st around. Pinch shut the top and sew closed. Ch 4, sl st in the 2nd ch from hook, sl st in next 2 st, ch 3, sl st back the forw. 1. Stuff HEAD firmly. Stuff BODY firmly and sew onto head. 2. Stuff ARMS and LEGS firmly and sew onto body. 3. Pinch EARS at the base and sew them closed at the bottom so that the ears curve together. Sew the ears onto top of head. 4. 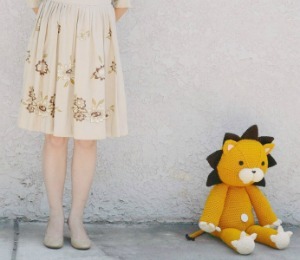 Tie on Pom Pom TAIL to the back of the body and hide the ends. 5. Cut out circle shapes from BLACK FELT for the EYES and sew or glue them on. 6. Cut out a small triangle shape from PINK FELT for the NOSE and sew/glue them on with Fabritac. 7. Embroider the mouth with black floss or cut from black felt. 8. Wrap a RIBBON and tie a bow around its neck. Hello! 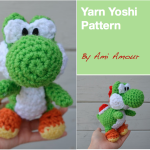 Thanks for the free pattern, Patches is adorable! 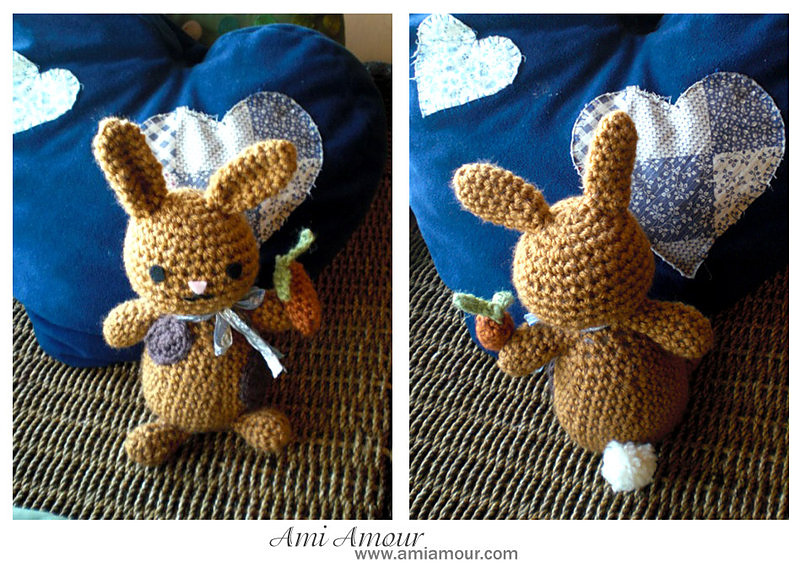 I made my own little pink bunny from your pattern, soon on my blog. Thanks for letting me know! I saw the bunny on your blog. And it came out super cute!! Love your creations. Can’t decide which one to try first! ! !